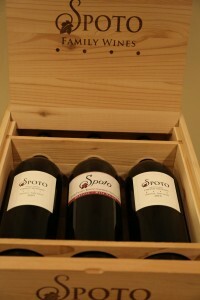 Spoto Wines was founded with the release of their 2004 vintage. 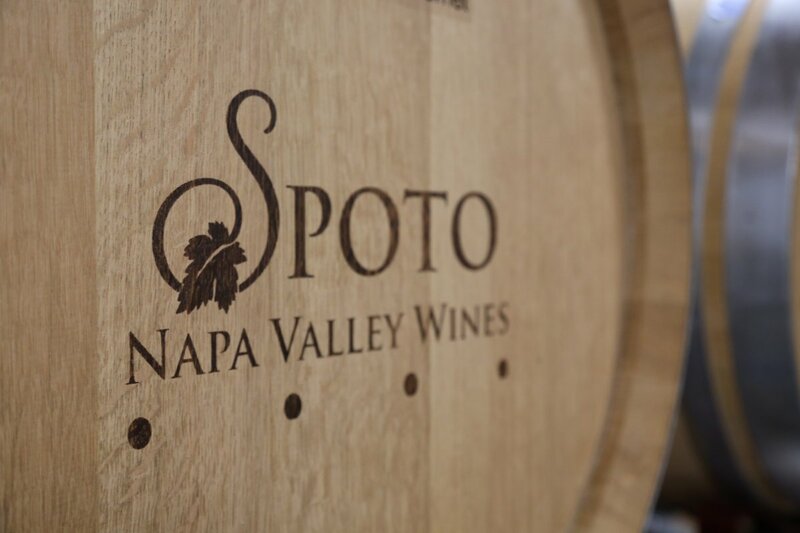 Proprietor Stuart Spoto did not start making wine then – rather he has been helping his father Henry make home wine since the early 1990’s from the Napa Valley. Stuart was raised in the town of Davis (about 40 minutes east of the city of Napa) and conveniently attended the University of California, Davis. His major was not Enology and Viticulture but rather was in Chemical/Civil Engineering – which he made a career of for 20+ years. Stuart has learned wine making by doing – from his father and from other wine experts including several of the faculty over the years in the UC Davis Viticulture and Enology program. Henry entered his wine in the Napa Home Winemakers Classic (was a prominent area competition judged by those in the industry for home winemakers). Henry took home several top ribbons which culminated in a Best of Show in 2002 (top wine of all the entries). The Wine Spectator even covered his success with a two page article in the June 2003 issue. Not to be outdone, Stuart followed this up a year later with his own Best of Show at the same competition. Both Stuart and Henry were introduced to Napa fruit in the early 1990’s by Dr. Christian Butzke who was an Enologist in the Department of Viticulture & Enology at the University of California, Davis. The vineyard which they have sourced from for both their home wine and now commercial wine is in the heart of Oakville – with prominent neighbors including Harlan Estate, Paradigm and Far Niente (west of Highway 29). Henry passed on two important points to Stuart when it comes to wine making: 1. Get good grapes and 2. Be obsessive about cleanliness in the actual winery. 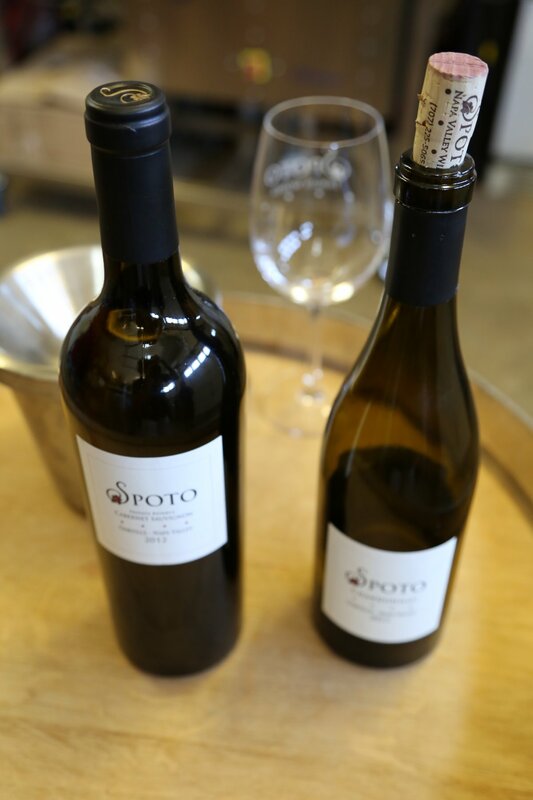 Stuart has taken this to heart for his Spoto wines – sourcing from premium vines in Oakville (the same rows each year) and being extremely attentive to keeping his winery clean. 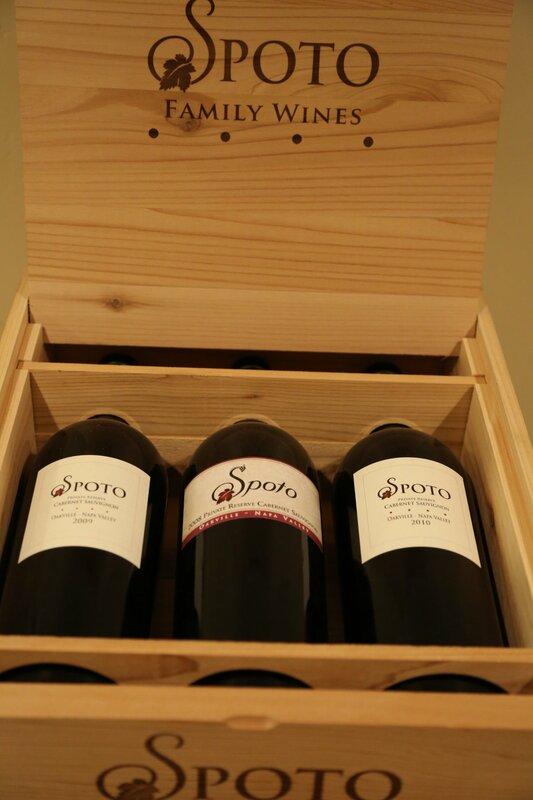 Spoto is a Napa winery located in a residential neighborhood in Sacramento. Prior to 2004 Sacramento had no “garagiste” wineries. Stuart recalls applying for a license for his winery and being turned away as there was never a precedent for this. Stuart persisted – and ultimately became Sacramento’s first bonded “garagiste” winery. The city now uses the template created when they approved his license to approve additional urban wineries. When Stuart told his father he was going to make wine commercially Henry initially discouraged him to do so – now it is a different story. Recognizing his son’s talents and passion for producing excellent wine – not to mention the lifestyle Stuart has created around this label, his father is rightly proud of his son’s accomplishments. And Stuart also makes his father a barrel of home wine each year. 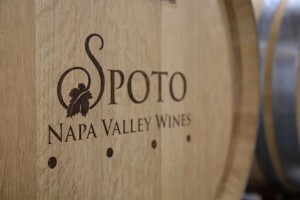 Stuart decided to focus his efforts on Spoto Wines full time in 2010. Around that time he also reached out to several vintner organizations in the valley. In order to be a member of the prestigious Oakville winegrowers association, the vineyard owner must be a member. This was not initially the case but Stuart convinced the owner to join. In order to join the Napa Vintner’s Association (the 500+ member strong organization that helps promote the Napa Valley) one must cellar and bottle at least one wine sourced and made from Napa grapes. Stuart located a winery in Rutherford and is where he makes at least one wine and often bottles his other wines here. His winery in Sacramento is one of the more carefully thought out and clean wineries of its size that we have seen. It is truly a winery in a garage conveniently located at Stuart’s home. Stuart is adamant about keeping the entire wine making process in house – his equipment was carefully selected to be able to handle higher production than what he actually needs. He even has a small very modern bottling line good for wineries in the 5,000 to 10,000 case production (he produces only about 500 cases each year). Contrary to popular belief there are small bottling lines that are relatively inexpensive. One room contains barrels of older vintages. Stuart keeps each barrel separate from the other until 9-10 months into the aging and then he creates his barrel selections and blends. The wine then stays in barrel up to 30+ months depending on the wine in question. He uses a large majority of new French oak. While Stuart is the primary winemaker his family certainly helps with the business including his wife Christy. His daughter Arianne, has a degree in Viticulture and Enology and according to Stuart, is trying to make wine commercially on six of the seven continents – having worked in South America, Africa, Australia and is now back in the states making wine in Central California. His other daughter Alexi has a degree in biochemistry and also is involved in the business. 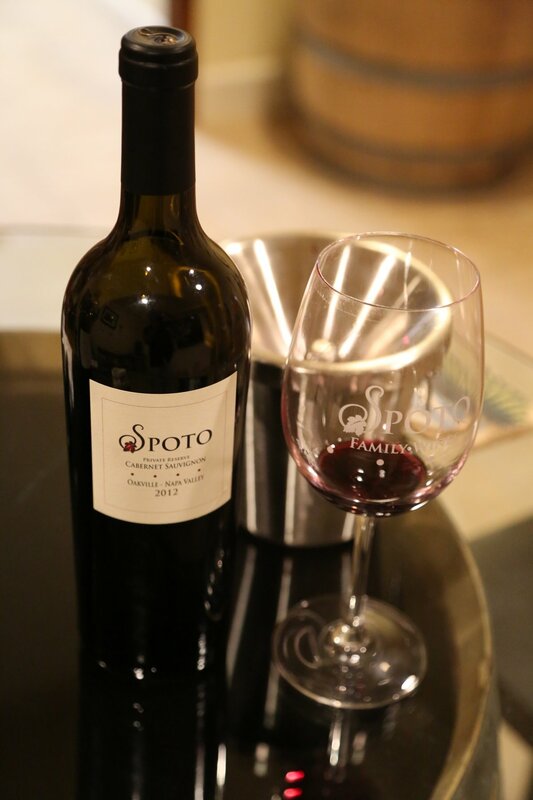 Today three generations of the Spoto family contribute to making the wines. The first wines Spoto produced were a Cabernet Sauvignon or a red blend. Stuart decided it would be nice to have several lighter style wines to pour at events and make available to club members. He typically alternates between making a small production Pinot Noir and a Chardonnay each year. The 2013 Oakville Chardonnay is sourced from another producer in Oakville who also makes a Chardonnay. This wine sees very little malolactic fermentation and also little oak during it’s aging. It shows subtle aromas, honeysuckle & stone fruit – the entry is soft showing with the palate showing flavors of peach, melon and a wet rock component. The wine is rounded on the palate – the finish shows some mineralities with notes of pencil shavings and lingers for some time with a slight viscosity. The 2013 Pinot Noir is sourced from the Russian River AVA in neighboring Sonoma County. The bouquet on this wine is layered and shows lots of complexities, especially as it opens. It shows baking spices early on then opens to raspberry and a cherry cola nuance. It is really an appealing bouquet. The wine is smooth on the palate with very good acidity – a lingering tartness and just a touch of vanilla. The 2012 Oakville Cuvée (Judy Ann) is a Merlot based blend of the five major Bordeaux varietals. Stuart names this wine after someone in his family each year – in this particular year it was named after an aunt, Judy Ann who passed away from lymphoma. Part of the proceeds from the sale of this wine are donated to the Dr. Joseph Tuscano’s Research Laboratory at the UC Davis Medical Center to help find a non-toxic cure for this terrible disease. This wine initially shows an earthiness on the bouquet along with ripe notes of raspberry and blackberry. Aromatically this wine is very generous showcasing rich mostly darker fruit aromas. And a touch of brown chocolate. It is rounded on the entry showing flavors of black cherry and hints of black licorice. Good acidity – the tannins linger for some time but are delicate and well integrated into the finish. This is a pleasing easy-to-drink wine that begs for another sip. The 2012 Oakville Private Reserve Cabernet Sauvignon initially reveals a sage component on the bouquet opening to show enveloping and ripe fruit aromatics. The finish is lively, lingers for some time with fine-grained tannins. These are tannins that are certainly noticeable but do not distract from the enjoyment of the wine. There is also just a touch of toasted oak on the finish. This barrel select wine is elegant and should age well for a number of years. Stuart introduced an Oakville Malbec to Premier Napa Valley (an annual wine auction held for trade – restaurants and wine retailers) held in February 2015. Oakville is certainly known for its premium and pricy Cabernet Sauvignons so when a different varietal is presented from this AVA it can strike up some interest. This is probably the most expensive bottle of Napa Malbec yet – a wine shop purchased this lot for their clients in Southern California for what was equivalent $250/bottle. The Spoto wines will age – Stuart held a special vertical tasting of Magnums recently for ten of his vintages – the older wines were holding up very well. Every year or two Spoto offers a very unique trip somewhere in the world. In 2015 a small group from the club went to Kenya and Tanzania to enjoy an African Safari. Future plans call for a trip to Sicily to enjoy a number of food and wine opportunities. With Stuart’s background in engineering and his passion for wine – he and a friend came up with an idea as an ad-on to the Coravin (a device that allows one to extract wine from the bottle without having to pull the cork). This device requires the use of capsules containing argon gas – the capsule must be replaced once it has been used a select number of times. Enter the Vino Argo – a much bigger “capsule” if you will – think of a Scuba Tank but smaller. The Vino Argo easily connects to the Coravin allowing one to keep pulling wine for many times without having to often replace the standard capsules. It is a useful addition to the Coravin, especially for those who have personal cellars and restaurant or retail outlets with a tasting presence who often need to go pull from bottles while alleviating the hassle and expense of constantly needing to replace the capsules. Thank you for such a lovely review of our wines!